Over the past month we worked on many new features, including putting the finishing touches on our Google Classroom integration that will unveil at the ISTE Conference later this month in San Antonio, Texas! Our team made improvements to slur positions, score formatting, and MIDI import, along with updating customer messaging across Noteflight. Now you can customize measure numbers anywhere in a score! Simply click the existing measure number in the score and type in a new one. Noteflight will auto-restart numbering from that point. Reset at anytime by selecting “Reset Measure Numbers” in the Measure Menu. 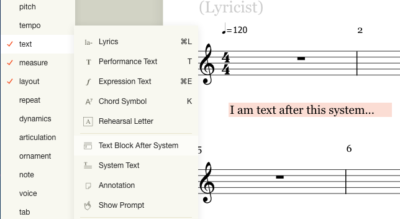 Noteflight customers have always liked using prompts for instructions at the beginning of a score. Now we have added text boxes after any system! This is great for writing instructions or notes that apply to entire systems. Noteflight will format the text box and space the system appropriately. To add a text box, first select any measure in a system then click “Text Box After System” in the Text Menu. There is now a new Statistics option in the Score Menu, which provides the total duration of the score. This is helpful when writing music for a specific length of time. Stay tuned for more helpful new features from Statistics! We have now added an instrument and score template for organ, with the bass clef pedal staff attached. Premium and Learn users can add this instrument to any score or start a new organ score from the “Create a New Score” menu. Time to write that new fugue! Stay in touch with the team if you think of any new features that might improve your Noteflight experience!